The Harriers face their toughest test of 2018 so far when they pay their first ever visit to Spennymoor Town for a game that will see fifth place Town take on fourth place Harriers. With just one point separating the two sides it will be important for us to get all three. Also take into consideration that The Moors have two games in hand over us then those three points on offer take a greater meaning to create a gap between the two sides. Both teams had good wins during the past week with the Harriers winning 2-1 at Curzon Ashton and Town winning their FA Trophy replay 5-2 at East Thurrock Utd. A hat trick for Andrew Johnson was the high point in the game while a low point came with a red card for Jamie Chandler but he won’t miss out on playing against us due to the strange seven day ruling in this league although if Spennymoor were a National Premier side then he would miss out. They have just the one injury doubt with Mark Anderson after he picked up a hamstring strain a few weeks ago and he’ll face a fitness test before the game. 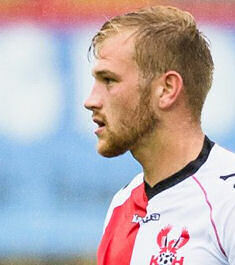 They strengthened the team just before the replay with Nathan Lowe joining them on loan from FC Utd of Manchester. He had previously been with Southport on loan and was an unused substitute in our recent 3-0 against them. In our game at Curzon on Tuesday evening it was a goal from Ryan Croasdale that gave us a second half lead but Curzon drew level soon after before super sub George Waring came off the bench to give us the winning goal. He was set up by a returning Dan Bradley who had come off the bench just minutes before Waring did. Bradley had been out for a few weeks, again, with a groin injury and let’s hope that’s the last injury he gets this season. The Moors are on a six league game unbeaten run, both home and away, with their last defeat coming at Stockport County just before Christmas. Ours goes back even further than that with seventeen unbeaten games since our last defeat in the league came at Tamworth way back in the mists of time – well September actually – and we now need to make sure we come back from this game with that record still intact. A draw would be a fair result but it wouldn’t be all that good for us if we aim to climb as high in the table as we possibly can. A win for us and a defeat for Brackley Town at Blyth Spartans could see us draw level with them on goal difference. A big win for us or a big defeat for them could see us into third place. If that aint a carrot what is? B Hall, Eve, Palmer, J Taylor, Horsfall, O’Connor, Vaughan, Pearson, Croasdale, Truslove, Weeks, Austin, Bradley, A Brown, Sonupè, McQuilkin, N’Gwatala, Ironside, Wright, Waring. Lowson, Porter, Chantler, Curtis, Mason, Griffiths, Tait, Dixon, Henry, R Hall, Chandler, Ramshaw, Anderson, Lowe, Johnson, Fewster, Foley, G Taylor, Mondal. Talk about the game here and phone the Harriers Hotline on 01905 577 777 after the game too.